The Achilles tendon, a strong fibrous cord, is the largest and strongest tendon in the human body and runs all the way from the calf muscles at the back of the lower leg down to the back of the heel or calcaneus bone. For added protection and functionality, the Achilles tendon is surrounded by a thin sheath. Synchronized with the calf muscles, the Achilles tendon plays a crucial role when jumping, running, climbing stairs or standing on the toe. Achilles tendon rupture is an injury that affects the back of your lower leg and can be a partial rupture or a total rupture. It most commonly occurs in middle-aged people (most commonly men) playing recreational sports. A total rupture is 10 times more common in men than women. This type of injury often occurs while practicing recreational sports that require bursts of jumping, pivoting, and running such as tennis, racquetball, basketball, and similar sports. The Achilles tendon can grow weak and thinner due to normal aging process and lack of use becoming prone to injury or rupture. An Achilles tendon rupture is seen more frequently in patients with preexisting conditions such as Tendinitis. 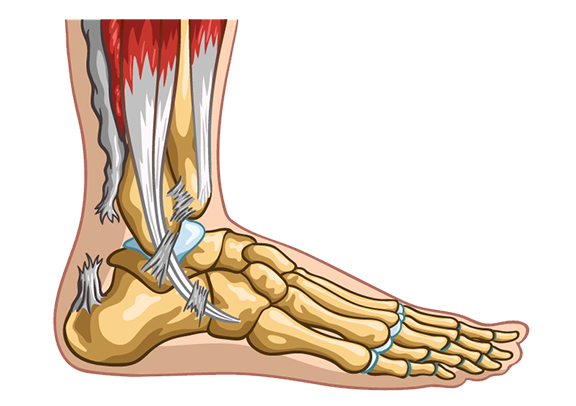 If an Achilles tendon rupture is suspected, seek medical attention as soon as possible. In most cases, surgery is required and, like any injury, the sooner it gets treated, the higher the chances of a successful recovery. Sometimes there is no need for surgery and the leg is put in a cast to allow it to heal. Following a surgery, a full rehabilitation program is absolutely necessary for proper recovery. After a thorough diagnosis which includes a physical exam and, sometimes, an ultrasound or MRI, the foot and ankle specialist will begin treatment based on the patient’s age, the severity of the injury and activity level. Non-surgical treatment for a ruptured Achilles tendon usually involves applying ice to the area, over-the-counter pain and anti-inflammatory medication, resting the tendon by using crutches, and keeping the ankle from moving (walking boot or cast). The Achilles tendon rupture repair surgery requires an incision in the back of the lower leg and suturing the tendon back together. When compared to non-surgical options, the surgical approach has a lower incidence of re-rupture and allows patients to return to their normal activities sooner with better functionality and less muscular shrink. Just like any other surgical procedure, there are some risks such as infection, anesthesia, scarring, bleeding, nerve injury, skin breakdown, and blood clots. However, with better technology and techniques, the risks are always minimal.